Cavendish is a village and parish in the Stour Valley in Suffolk, England. It is believed that Cavendish is called so because a man called Cafa once owned an eddish (pasture for aftermath) here. Over time, 'Cafan Eddish' became 'Cavendish'. It was home to Sir John Cavendish, the ancestor of the Dukes of Devonshire, who was involved in suppressing the Peasants' Revolt. Wat Tyler, the peasants' leader, was arrested by William Walworth, the Mayor of London, for threatening King Richard II in 1381. As Tyler fought back, Cavendish's son, also called John, who was responsible for escorting the King, ran Tyler through with his sword, killing him. As a result, John Cavendish tried to flee from the pursuing peasants, and he hung on to the handle of the door of St Mary's Church to plead sanctuary. A few days later, on 15 June 1381, the elder John Cavendish was seized at Bury St Edmunds and beheaded by a mob led by Jack Straw. He is buried in Bury St Edmunds. St Mary's Church had a bequest from Sir John, and its chancel was restored. The village has a United Reformed Church, where Catholic services are also held, and three pubs - the Five Bells, the George, and the Bull. Leonard Lord Cheshire and his wife Sue Ryder are buried in Cavendish Cemetery and there is a memorial to them within St Mary's Church. The museum at Cavendish is now closed but history of the Sue Ryder Foundation and life at the Cavendish home may be obtained from the Sue Ryder legacy and history team. As Cavendish was begun as a home for concentration camp survivors the charity holds some records of the people who were rescued by Sue Ryder. ^ Skeat, Rev'd Walter (1913). The Place-Names of Suffolk. The Cambridge Antiquarian Society. ^ "C is for Cavendish". BBC Suffolk online. Retrieved 2008-01-16. 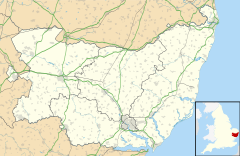 Wikimedia Commons has media related to Cavendish, Suffolk. The village has a strong social scene with regular events held on the village green. Annually Cavendish holds a summer fete which is held in September as well as a smaller fete organised for earlier in the year by the local church. Annually fireworks events are also held on the green as well as lots events in the local pubs and clubs. This page was last edited on 21 October 2018, at 10:01 (UTC).